The item Lady of Mercy, Michelle Sagara West, (ebook) represents a specific, individual, material embodiment of a distinct intellectual or artistic creation found in Charlotte Mecklenburg Library. A warrior and healer continues her struggle against the forces of evil.... 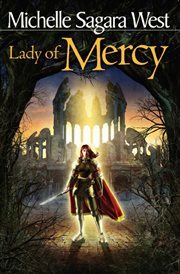 The harrowing tale of Erin Elliath continues in this novel of the battle between good and evil. When Erin rejects her position as Lady Sara, wife to the First Servant of the Dark Heart, she escapes from her husband's lands with the help of Darin, the Patriarch of Culverne and the last of his line. After combining forces with the deposed prince of Marantine and a mysterious old man-who has magic skills that neither Erin or Darin can identify-the foursome hatch a plan to wrestle control of the usurped kingdom of Marantine away from the priests of the Dark Heart. Meanwhile, Erin continues to struggle with her part in the betrayal of her people, the deaths of her most beloved friends, and her feelings for the man who doomed them for her sake..